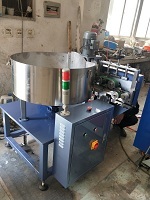 in 2019, our factory improved the paper core inserting device for our thermal paper slitting machine. there are some buyer response that our old type paper core inserting device has big noise. in order to satisfy the customer, we improve the new type paper core inserting device. low noise, stable operating and fast operating.